Our teacher is Miss Atamaniuk and our wonderful teaching assistant is Mrs Greaves. Above you will find links to weekly homework, termly overviews and key information about life in year 1. 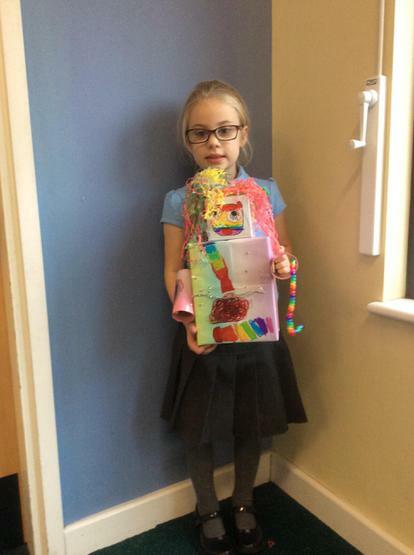 Our page will give you a weekly insight to all the fun things that we have been getting up to in school. Enjoy! We are nearly there! The last full week together as a class! And what a busy week it has been! We have enjoyed performances from the recorder players and the drummers. We were very impressed and loved dancing along to the drum medley at the end! We have also had the governors awards. A big well done to Imogen on achieving this award for class 3. We are so proud of you! As we go into the final 3 days, we have lots to look forward to. And we plan to make the most of our final days in year 1 by having lots of FUN! The children have had a fantastic week learning all about different vocations during aspirations week. They have gained an insight into being an explorer, a firefighter, a nurse, a florist, an athlete and a detective! They also got the opportunity to work with lots of different teachers. The teachers have been very impressed with their behaviour, attitude and team work. Well done class 3! What an exciting week it has been! The children had an absolute blast at The Space Centre! Fun from the start... the children loved spotting all the brown signs on the bus! Which added to our excitement! The children loved looking at the space rocket! They enjoyed making the water powered rockets blast off! After looking at all the exhibits, the day came to an exciting end with the impressive space show! It really felt like we were in space! Thank you to all of the parents who volunteered to help...I'm just sorry we couldn't take you all! We couldn't give the children wonderful experiences like this without your support! Have a great (hopefully sunny!) weekend and see you all on Monday. Firstly, we need to say how massively proud we are of the children this week! They have taken their phonics tests in their stride and all of them have done their absolute best. Well done year 1! This afternoon we thanked the children for their hard work with a phonics party, with food, dance and fun! The children have been doing lots of work on the book 'The Way Back Home' by Oliver Jeffers. They finished today by writing their own space story. The children had some lovely ideas and did some wonderful writing. Me and Mrs Greaves would just like to day a massive thank you for all your support at home. It makes a big difference. It may have been a short week, but the children seemed to have worked extra hard! We have been getting in lots of phonics practise... the children have done so well! We are very proud of them. We have talked about what they mean, and the sort of things we could do to show these things. Already I have seen the children showing these things, day in day out. Well done class 3! What a fantastic week! We have all been working our socks off! 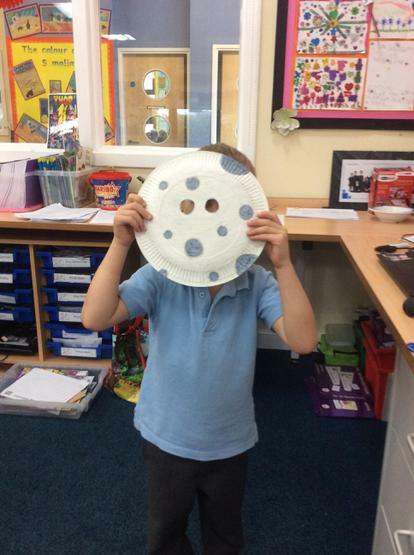 In maths, we have been learning how to find a quarter of a shape, object or quantity. The children absolutely loved using sweets to find a quarter of a number... but not quite as much as they enjoyed eating them! Today has definitely been a highlight! 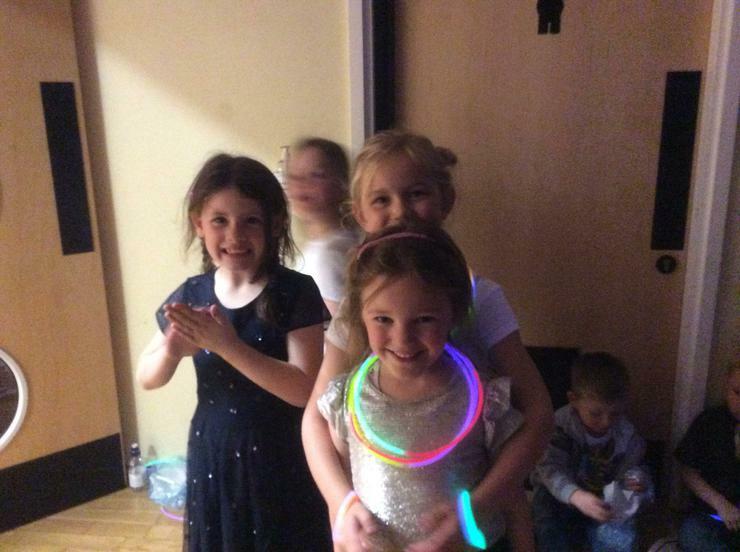 The children have really enjoyed all the celebrations. We went up to the field to play some classic games, such as croquet. We made our own crowns, which the children wore with pride! The children have been phonics superstars this week! We have been getting in lots of practise at reading real and alien words. 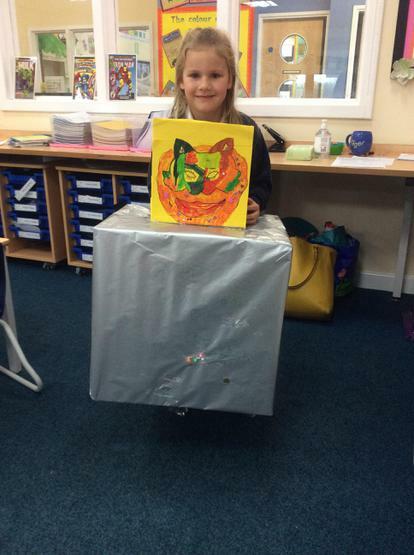 The children have loved making their own aliens! They then used phonics cubes to write an alien word on it and swapped them with people in class. Thank you to all the parents who attended our phonics screening information event. For any parents who missed it and would like more in formation please get in touch. You should have received the information pack in your child's school bag. Since returning to school, we have been treated to some lovely weather, which we have definitely made the most of in Class 3! The children have loved our new focus in PE- The Invictus Games. In maths, children have been learning how to group and share equally. For homework this week we have given the children an abacus activity based on coin recognition as this will support some of the work we are doing next week. We will be doing a parents information meeting regarding the phonics screening on Tuesday 8th May at 2.45. If you wish to attend please arrive at the school office around 5 minutes before. Have a lovely bank holiday weekend. See you all next week! It was an exciting start to the week, with our school science fair. We got to share our learning from last week with the rest of the school. Some children stayed in the hall to explain to others what we have done. We really enjoyed looking at other year groups work too! The children have been so motivated by our sports relief challenge this week, 'Road to Russia.' We have run, walked and rowed 158 miles as a class, smashing our 125 mile target! Well done class 3! There are no spellings for next week. as it is assessment week. But there has been homework sent out. Have a lovely weekend. World Book Day: The children had a great time celebrating World Book Day! We were learning all about the author of Paddington Bear, Michael Bond. We learnt lots of interesting facts about him and the children did some very impressive biographies based on his life and work. The children really enjoyed welcoming a Year 4 class to our classroom for some reading in the afternoon. The children shared some stories and showed off their fantastic reading skills! In English this week the children were working on their speaking and listening skills. We talked in groups about what Paddington might have in his suit case, using clues from the story to help us. The children then presented their ideas to the class! Great job Class 3! In maths, the children have been learning all about length and weight. They have really enjoyed using cubes, rulers and the scales to explore the length and weight of different objects. Thank you to those that came for parents evening, I always enjoy to share your child's achievements with you! You should all be very proud! An expected first week back..... what a lot of snow! After two unexpected days off school, I thought that I would give you an update on next week. World book day will be on Monday, we will be learning all about Michael Bond, the author of Paddington Bear. There will be lots going on in school and the children will get the opportunity to share some of the day with children from other year groups. I can't wait to see their costumes! I will also be sending parent evening appointments out on Monday. I hope you are all safe, warm and well. I'm sure the children have enjoyed some of the benefits of the adverse weather! We have started learning about Christopher Columbus and his journey across the Atlantic. The children have enjoyed acting out his journey and reading diary entries of what it was like. In maths, the children have been representing numbers to 50 in different ways. They have used tens and ones, Numicon and peg boards. Thursday was internet safety day and the children listened to a story about how to stay safe on the internet. They also learnt a song. Can you remember it?! This has been our last week learning about space and Neil Armstrong. The children have continually impressed me with their knowledge,enthusiasm and curiosity. We have learnt so much! In English, the children have out together their fact files. They are amazing! We plan to make a book with them, for the book corner. The children have also been out and about today sharing their knowledge with others. We have taken our finished planets to show year 5, as they are about to undertake a similar project. 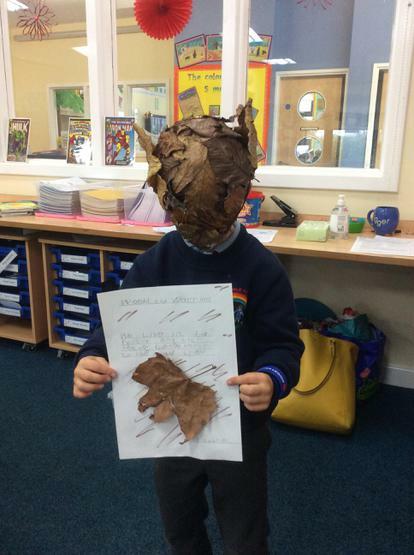 The children told them all about how we made them and what we had learnt. Firstly, can I say how impressed I am with all the effort the children put into their homework! They couldn't wait to tell me everything they had found out about space! In English, we have begun writing our own information page about Neil Armstrong. The children have spent the week gathering information. Then today they have started the first draft of their writing. The children did a fantastic job! In fact the writing produced today would not look out of place in a published book. In maths, the children have been practising their subtracting skills. We have used cubes and a number lines. They have had a go at writing their own number sentences and have working out how many had been taken away in missing number calculations. Coral Vorderman... watch out! The children have carried on working on their paper mache planets this week. They added more paper mache and painted them white. We love getting our hands messy! Another busy week in class 3! The children have been working their socks off learning about space. They learnt about the planets and what they are called. They had a great time paper mache-ing balloons; ready to turn into different planets. They looked carefully at the colour and size of their chosen planet. They are going to look amazing..... after we have added a little colour! The children have loved this new topic; we have asked them to research a few space facts as part of their homework. We will share them next week... we may all learn something new! Welcome back and a happy new year! I hope that you all had a lovely Christmas. The children have come back full of beans and ready to learn. :) Our new topic this half term is explorers. We are starting by learning about space explorers. After reading the book 'The Sea of Tranquility', children have done pieces of writing describing the planets and the astronaut in the story. They really enjoyed coming up with words to describe him in partners. In maths, children have been learning to make number bonds to 20 and to add to 20 by making 10 then finding what's left. They have this for their homework to get some more practise. The children started a unit of work in ICT this week. They really enjoyed using the laptops. They learnt how to log on, use the mouse and keyboard and use given internet links to learn about space. Well what can we say, we could not be prouder of the children. They have done an amazing job this week with the nativity. Thank you to everyone who came to see it, as well as those who supported with costumes, learning lines and songs and bringing your children back to perform. 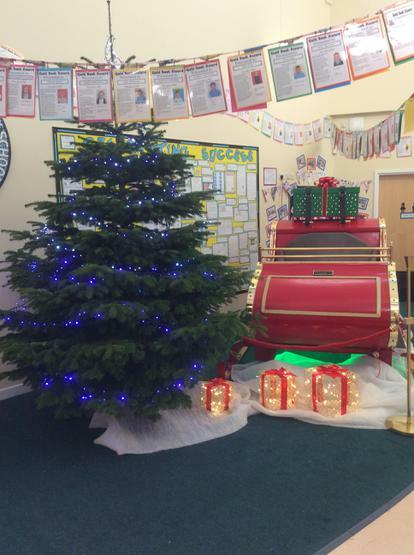 It's beginning to look a lot like Christmas at Greasley Beauvale! Santa's sleigh is having a rest in the corridor. Ready for it's long journey! It really is the most magical time of the year! We've heard that little elves live inside. In English this week, the children have been learning to use exclamation marks in their writing. They had a great time acting out different sentences with exclamation! They also did some super writing.. showing what Traction Man and the Spoons said on Traction Man''s latest adventure. 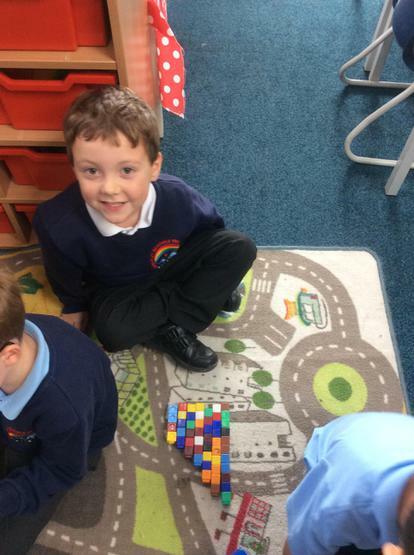 In maths, the children have been finding double and half of numbers up to 20. They were really confident at both by the end of the week. 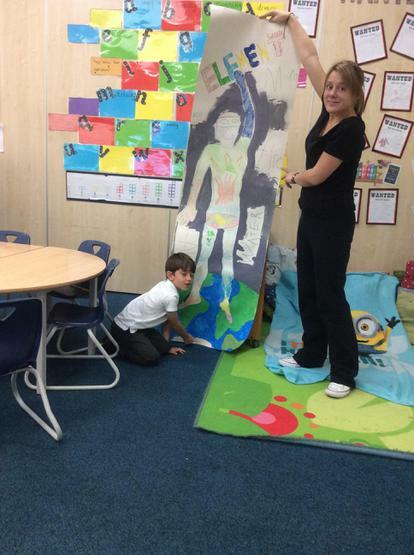 The children have been having fun learning about Traction Man's next adventure this week! Deep in the water of the kitchen sink! The children did a wonderful job labeling things in the kitchen and then thinking fo adjectives to describe them. In maths, the children have been learning about 2D shapes. They loved using the I Pads to take photos of 2D shapes they could see in school. 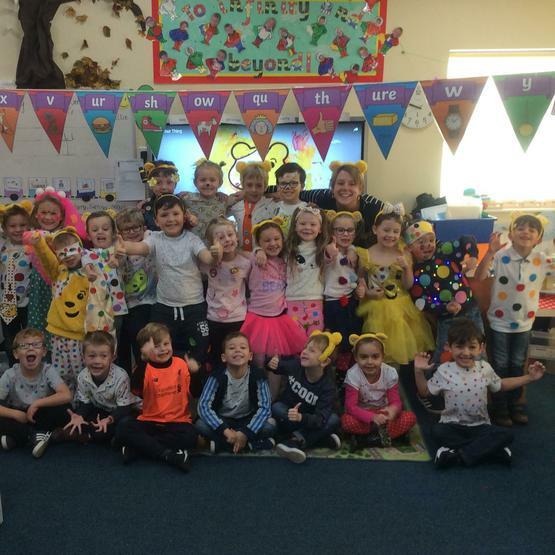 We have had an amazing day for Children In Need today, The children looked fantastic! Well done to Tommy and Riley on a great performance on our Greasley Beauvale catwalk! Thank you for all of your kind donations! The children have been busy bees this week! In English we have been learning about when we need to learn full stops. We have been using them for names of people, places and days of the week, as well as the pronoun I. Not only this, but children loved using props to act out Traction Man's first adventure. In maths, children have been working hard on their subtraction skills. We are becoming so much more confident! 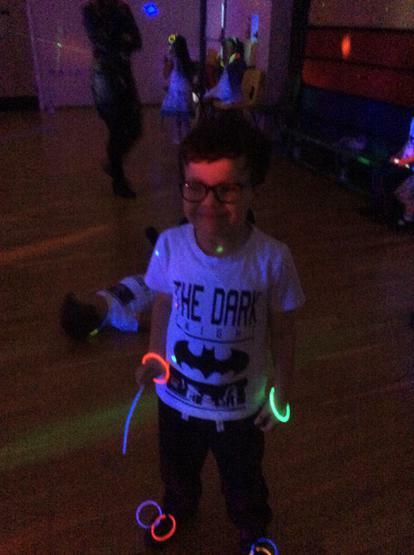 The children had an absolute blast at the school disco! It was great to see them all glowing in the lights! A fantastic first week back! We arrived back to a letter from Traction Man. The children enjoyed finding out about some of his special super hero equipment! We thought of questions we could ask him and then used them to write him a letter! Though, they might take a while to reach him as he is currently on a deep sea mission! In maths, the children have been finding number bonds to 10 and using equipment to subtract. We are also becoming pros at our 10 x tables. The children have WOW-ed us with some of the amazing work they have been doing over the holidays. 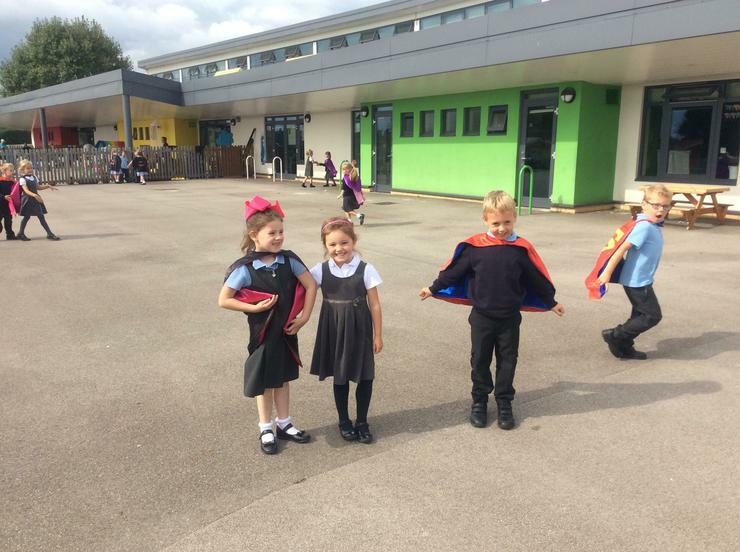 We set them a challenge to create their own super hero. Here are just a few! The children have done some super writing all about The Mighty Mean Machine this week. They used words with the suffix -ing to describe what he was doing- crushing, crashing, zooming! In maths, the children have been working on addition. They have been working hard splitting up numbers to see what they are made from. Another busy week in Year 1! Firstly, a big thank you for your support with the Macmillan coffee afternoon. It was a huge success. We raised over £1600 for this worthy cause. Fantastic! This has been out last week learning about The Three Super Pigs. The children have spent the week learning about different past tense verbs, they had a go at using these in their own stories today, Great job guys! 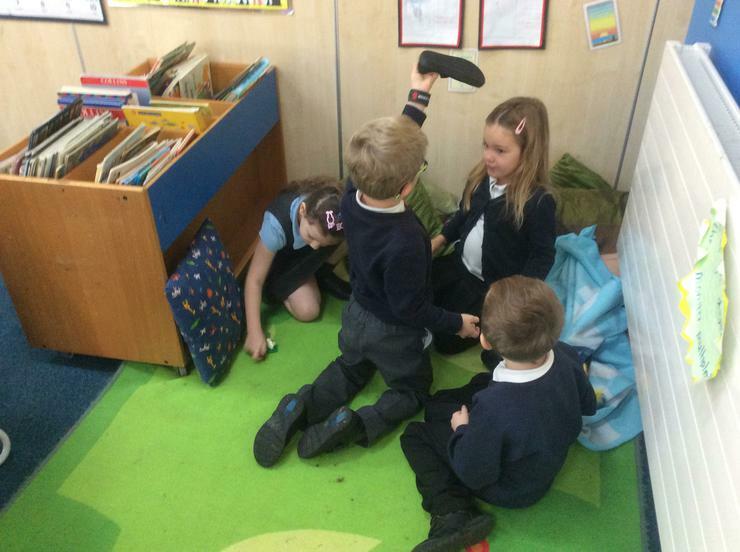 We have really enjoyed this story, one of our highlights being acting out the story. In maths, the children have been suing ordinal numbers, We have been running races and awarding places. We also played games where we had to use ordinal numbers. Have a lovely, restful weekend. some wonderful freeze frames showing what he planned to do. The children then wrote about it today. Their writing has blown me away! Amazing! In maths, the children have been learning how to compare objects and numbers using the signs < > and =. They have mastered it! They have it for their homework this week. A big thank you for all of your generosity and support for our McMillian event today, We have been over whelmed by cake, donations and offers of help. The children very much enjoyed going down this afternoon and taking part. The children have been working very hard this week! In maths, we have been doing lots of counting activities. Children have been counting forwards, backwards and from different starting points. We enjoyed using the cubes to represent numbers. 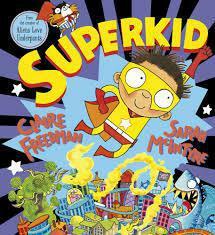 The children have loved our story this week, Superkid. What a busy first week back! We have been so impressed with how the children have settled in! They have taken all the changes in their stride. However, we are still working towards making our classroom feel 'like home.' We have had time to explore; finding out about different areas of the classroom, we have been given our own home places to sit in and we have taken on extra responsibilities. Lots of us have helped with the daily jobs in the classroom. This week the whole school have been learning about a special book called, 'The Colours of Home.' We have done lots of artwork based on the book. Firstly, we did some art showing what Hassan's home looked like. Then we did pictures of our own homes using wax crayons. Look out for our work taking pride of place in the corridor. What a great first week back. Class 3, I am proud of you all! Digger and the Gang Nash's adventures in English, Maths and Science - from BBC Schools. Phonics Play Great games to help you learn your spellings! Magic Key Adventures Lots of fun and games whilst learning about words and writing.